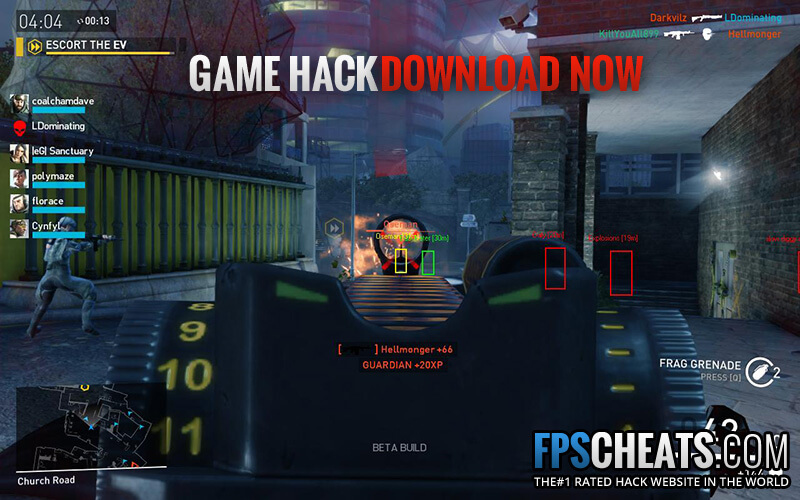 Do You Want Dirty Bomb Cheats? 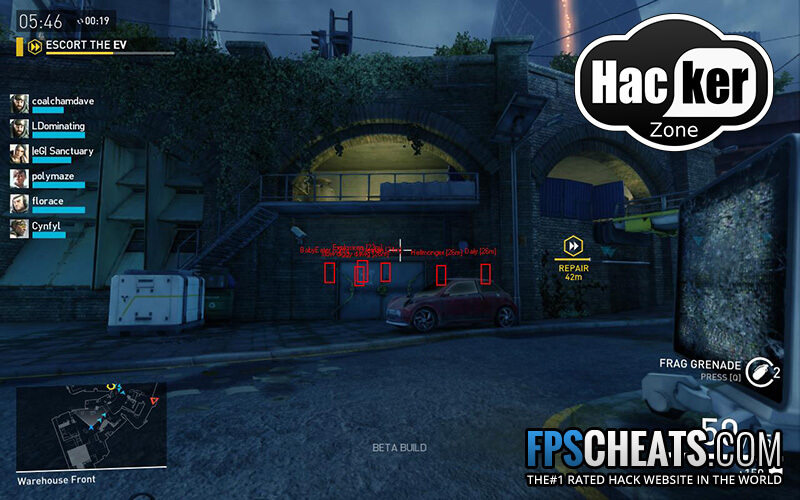 We have one of the first ever Dirty Bomb cheats released for the game. As soon as the Alpha came out we went to work on the game, and now the beta is out and we hacked it as well. The great news is everything is undetected, and you can win every single round with ease. Don’t worry about having to pay for weapons, we can help you rank up and unlock everything in hours, not months. You can grab Dirty Bomb for Free on the main website or on Steam. 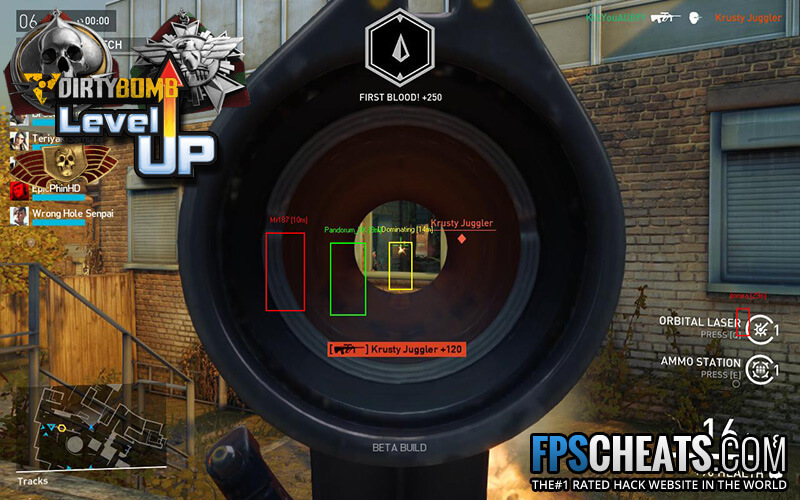 How Do Our Dirty Bomb Cheat Work? All Dirty Bomb Cheaters use custom code to help them see every enemy player and kill them instantly. We use ESP to let you see a box drawn around the players; this helps you know when they are coming. Then simply hit the aimbot key and fire, they die after a few shots. Usually, the enemy team won’t even see you coming, check out the video for a great example. 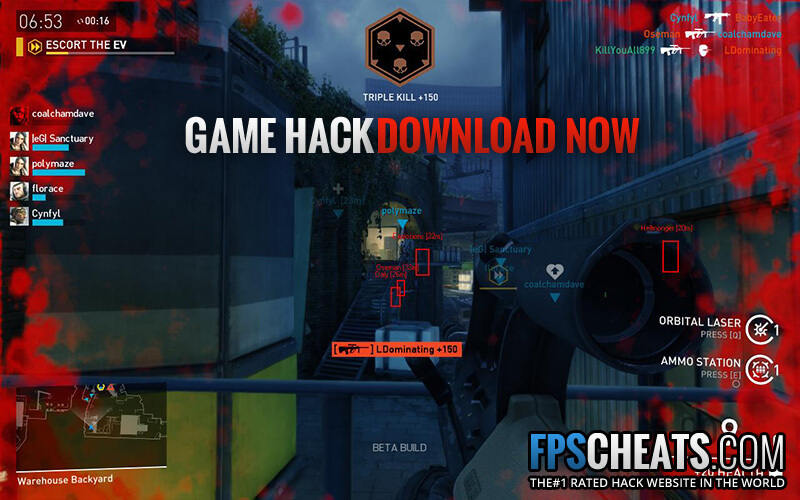 You can download the cheats for free when you become a new VIP on our forum. 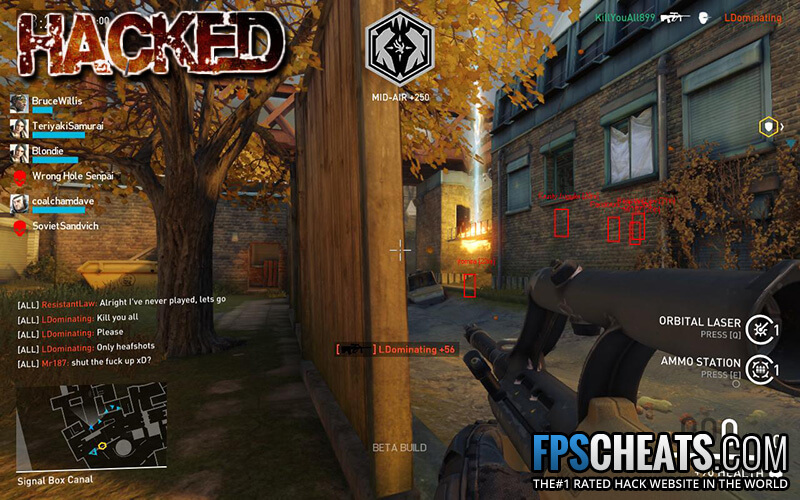 Why Do People Use Dirty Bomb Hacks? Being around in the online gaming scene has opened your eyes to the many games that are quite fantastic by themselves. However, if you enjoy blowing the heads off of your enemies (virtually, of course), then you are in for a treat. The name is Dirty Bomb, and contrary to what you think, this game is not dirty because of other reasons. In fact, it has received quite an acclaim following the release of the beta version. Dirty Bomb is a first person team shooter that’s a free to play MMO (massively multiplayer online) role-playing game. Dirty Bomb was developed by Splash Damage, the traditional creator of Wolfenstein: Enemy Territory. Dirty Bomb is a slick, fast-paced, shooter for fans who love to run and gun all day. As a matter of fact, you would see that while playing the game, you will find yourself constantly rushing to keep yourself from getting killed (again, virtually of course). Dirty Bomb takes place in London during an apocalyptic period. Some nuclear wipeout has occurred; Mercs have to find scraps of things that are usable. For them to survive, they must work with other survivors to keep themselves alive and to defend themselves from those who just cannot see them as allies. The whole point of the game is essentially to be greedy and hoard all the things that you think are useful for your team’s survival, which is pretty much the same with any apocalyptic game. More than just a mere fast paced shooting game, Dirty Bomb requires you to go through a series of maps, each containing a set of objectives in which you are asked to defend or shoot something. The commands range from placing bombs in certain areas and blowing up the things near it to the simpler ones such as getting to place some objects from one location to another. The whole thing also allows you to complete small challenges so that your team some advantages that could either help you actively or disable your enemies and keep them from attacking you. All in all, the game is pretty much to the point. There’s practically no fuss in the gameplay. Just follow orders, plant bombs, shoot people and all things similar to these. From the site’s description, Dirty Bomb’s gameplay is not meant to be mastered even by the most competitive players online. That is just how challenging this game is. It promises to give you and your teammates a heck of an experience with its fast pace and ruthless storyline. What sets Dirty Bomb apart from its rival shooting games is that the individuality and the uniqueness of each player help the whole team win the battle. Simply put, the game allows teamwork to make its magic in winning the whole thing. Each player is supposed to have a skill or a characteristic that is different from that of the other players. You can make use of these unique abilities to either synergistically improve the attack of the whole team or to protect one of his or her teammates. These skills could have an impact on how the whole battle runs. For instance, a particular character could unleash his power of creating something in the wind that could destroy the enemies’ efforts in protecting a certain objective. You could even have a teammate’s character run around for those who need to have their health restored which, as mentioned, could significantly improve your team’s chances of getting ahead in the battle. You can quickly get the hang of Dirty Bomb as long as you are familiar with each character’s job and can play them well. If this is the case, you would not have to have the nagging from your online teammates. Dirty Bomb is still in an open beta version. With this, it is quite evident that the game is still in its infancy. Nevertheless, it is still able to provide adrenaline junkies like you some action packed gameplay with its two game modes – Objective and Stopwatch. With income generated from in-game purchases, the developers of Dirty Bomb are promising for more features in the future. Dirty Bomb is primarily a free-to-play multiplayer online game. However, just like any other free game that are available on any platform, you have to expect some limitations on the features that you can enjoy. For instance, you can only have a limited choice of characters to choose from if you prefer to play without ever getting real money involved in the game. Although the complete set consists of 12 characters, you can only have access to only 2 or 3 of them at the start of the game. The game makes use of Dirty Bomb credits as currency. You can increase your credits by completing tasks and getting into battles. If you want things to get a lot easier and quicker, you could just buy Dirty Bomb hacks and unlock everything in a day or so. The credits could allow you to purchase a lot of things in the game, such as Loadout Cards that could increase your stats and provide you with some advances in your weaponry. So sign up now and get access by registering on our forum.